The Society seeks to encourage the pleasures to be derived from the study of ancient and medieval coins. Our prime objective is the study, research and publication of information, and to further the education of its members regardless of their level of knowledge. The web server with the IP-address 69.65.3.176 used by Classiccoins.ca is owned by WebHostingPad.com and is located in Arlington Heights, USA. 32 other websites are located on this web server. Most of them are provided in the english language. 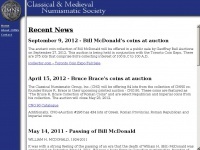 The websites of Classiccoins.ca are served by a Apache server. The obsolete technology of framesets is used on the webpages. Both the inclusion of the website in search engines and follwoing of its hyperlinks is explicitly allowed.